The contest is over. And the winners, chosen randomly, are Anita E and Mical! Congratulations! Please email your mailing address to lhlerman@gmail.com before March 25 to claim your prize. The first season of TURN: Washington’s Spies, AMC’s war drama set during the American Revolution, arrives on disc on March 3 and Disc Dish has two Blu-ray editions to give away to a pair of lucky readers! 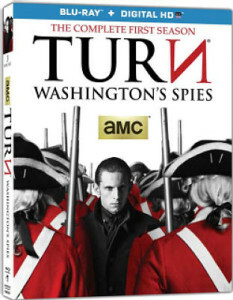 TURN: Washington’s Spies: The Complete First Season, based on Alexander Rose’s book Washington’s Spies, Abe Woodhull (Jamie Bell, Man on a Ledge), a farmer living in British-occupied Long Island, who bands together with a disparate group of childhood friends to form the Culper Ring. Together they risk their lives and honor, and turn against family and King, for a fight they believed in passionately, ultimately helping George Washington turn the tide of the Revolutionary War in favor of the rebels. Their efforts also revolutionized the art of espionage, giving birth to modern tradecraft as we know it today, along with all of the moral complexity that entails. This giveaway runs through midnight, Tuesday, March 17, and the winners will be at random and announced her on March 18. So, make sure you check back to see if you won! NOTE: The contest is only open to readers who are 18 or older and in the U.S. Prizes cannot be shipped to P.O. boxes! Oops…user error on google+ share; here it is in proper format. I think the change to DST has thrown me for a loop. I subscribe through email to discdish.com. Thanks so much discdish.com. I’m really looking forward to watching the first season of the show. Thanks for all the reviews and of course the giveaways!